The church was founded /organized June 6, 1968 under the name True Vine Baptist Church. The church was organized in the home of Bro. & Sis. Leo Gibson on Kirk Street in Houston. Persons in attendance were Rev. M.D. Smith, Rev. Fred Dixon, Rev. Marvin Bennett & wife. Rev. Bennett was chosen as the first pastor. Along with the pastor, five members joined they were Bro. & Sis. Norris Littles, Bro & Sis. Leo Gibson and Bro. Gurvis. The first worship service took place at the True Level Hall on Lyons Ave. On that Sunday a few other pioneering members were added: Bro. Ray Jackson, Sis. Pearl Owens, Sis. Tina Lacy, Sis. Mona Wallace and Sis. Ida Smiley as a honorary member. But not for long, through prayer, the Lord directed our minds to call the Rev. Jesse H. Jones, Sr. he accepted the challenge. The growth of the church created a need for a permanent dwelling place. A new place of worship was found and the move was made to it's current location on Sandra St. in Northeast Houston. 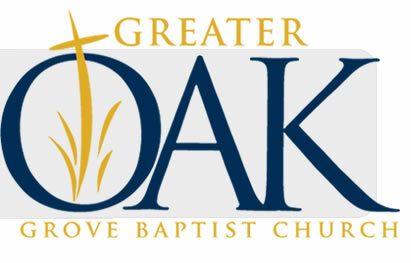 The church name was changed to Greater Oak Grove Baptist Church. Under Pastor Jones' leadership the membership continued to grow. In 1995 a multipurpose wing was added which included classrooms, fellowship hall and administrative offices. Pastor Jones with his devoted wife, the late Sis. Verstine Jones by his side, faithfully led this flock for 35 years. With the motto "Let every saved soul help save a soul." On August 23, 2003 our beloved Pastor Jones went home to be with the Lord. After the passing of our beloved Pastor the church chose one of our own. Rev. D. Earl Lewis became the 3rd Shepherd of the church. Pastor Lewis began watch on the 3rd Sunday in November of 2003 (35 years to the day in which Pastor Jones began.) Pastor Lewis served as the Assistant Pastor under Pastor Jones for 7 years before being called to lead the New Beginning Missionary Baptist Church in 1998. Through the guidance of the Holy Spirit and this visionary leader, the church has transitioned from programs to purpose. Rev. Lewis' vision for Greater Oak Grove is to become a "Campus for the Community." Several community minded ministries have been implemented. This God blessed sanctuary is located at 9829 Sandra St. Houston, Texas in the Shady Tidwell Timbers addition of Houston. On March 25, 2007 the Fellowship Hall was named the Jesse H. Jones, Sr. Memorial Building.